I’m no NIMBY, but I liked how you used to be able to see all four Bay Bridge towers from the park. The westernmost tower is now obstructed by One Rincon Hill, as you can see here. Thankfully, Susie at Curbed says plans for Two Rincon Hill, which looks like it would have obstructed the next westernmost tower, have been scrapped suspended, due to some kind of problem with the economy. Link (via SFist). Update: Whoops. View of Bay Bridge from Dolores Park to remain somewhat unobstructed, for a while longer at least. Thank goodness! The first one is bad enough. Quelle eyesore! 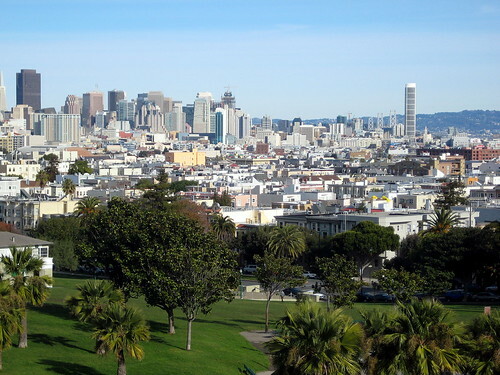 Homeless crack head shitters in Dolores don’t deserve their view. wait…uh…WHAT HAVE YOU DONE WITH JIMBEAM?!?! i want ten more of them. only higher. Well if they’re higher, a lot higher, that’s something I could get behind. I beat you to the punch! now now. the view is for everyone. even i know that.